3 editions of The Englishman's Bride found in the catalog. Add another edition? Are you sure you want to remove The Englishman's Bride from your list? Published September 1, 2004 by Harlequin . Sir Philip Hardesty, a negotiator for the United Nations, is famed for his cool head. But for the first time in his life, this never-ruffled English aristocrat is getting hot under the collar -- over a woman! 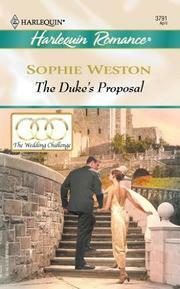 Kit Romaine is not easily impressed by money or titles; if Philip wants her, he's going to have to pay her. Once Kit agrees to be his temporary assistant, Philip knows he's halfway there. Now he just has to work on making her his bride. October 31, 2017 Edited by xandri Edited without comment.